The Stainless Guide is the globally leading directory for stainless steel semis. With detailed information on several thousand suppliers (producers, traders, service centres and stockholders) of stainless steel semis, including flat and long products, tubes and pipes, and relevant fittings and accessories, the Stainless Guide is the globally leading reference source for suppliers, users and processors of stainless steel, nickel and nickel alloys, titanium and titanium alloys, etc. Suppliers of equipment and services can be found in the section “Equipment & Services”. The Stainless Guide is published annually with a circulation of 20,000 copies. 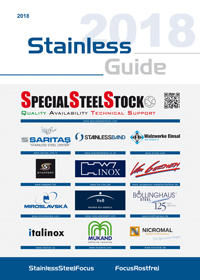 Would you like your company, your products or services, to be included in the Stainless Guide? Then send us your entry/advertisement.